Teeth grinding, medically known as bruxism, is estimated to affect between 30 and 40 million Americans. However, most of those who suffer from bruxism are unaware of the condition. That is because the majority of teeth grinding occurs during sleep. For patients who grind the teeth at night, the condition is often diagnosed by a dentist when the patient is seeking treatment for other conditions that arise as a result of bruxism. Our cosmetic dentists can diagnose bruxism for Red Banks patients, as well treat teeth grinding and its resulting symptoms. If any of these symptoms are present, a dental appointment should be scheduled in order to diagnose the cause. If our dentists suspect bruxism, a thorough exam will be performed and will include a discussion of the patient’s general health, use of medication, sleep patterns, and possible sources of stress, along with an examination of the teeth and jaw muscles. If the teeth show signs of wear or damage, our dentists will likely look for signs of TMJ problems or alignment issues, both of which are associated with bruxism. Treating bruxism will be largely dependent on the cause of the condition. Cases of bruxism that are caused by medication or stress will likely require additional treatment by a physician or counselor. 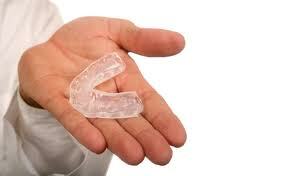 However, even in these cases, a dental mouth guard can be useful in preventing bruxism. This device can be custom-made to fit our patient’s teeth comfortably and securely. The mouth guard is then worn at night in order to prevent teeth grinding while the patient sleeps. Patients who have dental conditions that have either resulted from or caused bruxism will also need to be treated. Our dentists offer thorough dental care including orthodontic treatment and TMJ treatment, both of which can help align the teeth and jaw to prevent teeth grinding. Tooth damage that has been caused by the grinding and clenching will also be treated appropriately. Restorative treatment for damaged teeth includes inlays, onlays, and dental crowns. These treatments serve to repair, strengthen, and protect the teeth. If you have experienced any of the common symptoms of bruxism, schedule an appointment with one or our experienced dentists today. If a patient shows signs of bruxism, we will offer treatment to prevent teeth grinding and restore the teeth to their natural strength and function.